Home / Fanboy Fail Fridays! / Fanboy Fail Friday! Disses From The Cast Of Stranger Things! And During Awards Season! Say Wha? Oh Winona Say It Ain’t So! Fanboy Fail Friday! Disses From The Cast Of Stranger Things! And During Awards Season! Say Wha? Oh Winona Say It Ain’t So! Don’t you hate it, when you have a fail for a show you really like. It’s interesting because should this affect your enjoyment of the show, can you still be a fan when the stars of said show are not that fan friendly? It’s tough because everyone has bad days clearly but when there’s a pattern of behavior ala Natalie Portman, Bruce Willis, etc… Does it and should it taint their work. I mean, I still love DieHard even though I know Bruce Willis is a jerk. Okay. I’ve been plagued by this when thinking of Stranger Things. There’s been a couple events now where the cast has been at and they are just not nice. A couple of the kids will still do it if you can get to them, but otherwise, man… talk about a project going to someone’s head. 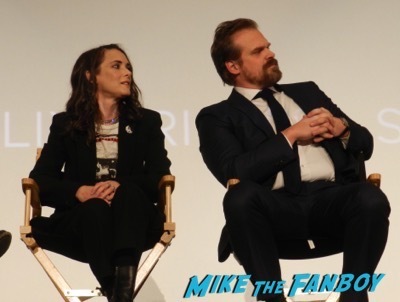 This week there was a q and a, the second q and a of the season but this time Winona Ryder was going to be there and I love her. I know, I know. I figured there was a 10% chance I could get her, but still… It’s a shot right? 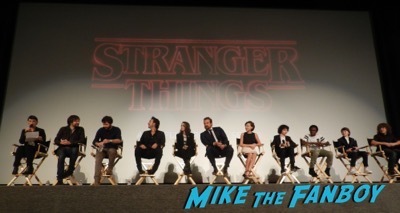 At the q and a were: Writers, Directors, and Executive Producers The Duffer Brothers, Executive Producer and Director Shawn Levy, and Actors Winona Ryder, David Harbour, Finn Wolfhard, Caleb McLaughlin, Gaten Matarazzo, Noah Shnapp and Millie Bobby Brown. Hopes dashed. The first q and a for Stranger Things featured only the kids and they pulled the same thing. Well, what’s doubly irritating is that the cast really didn’t HAVE to leave. They hung out in the parking lot for a good 10-15 minutes. In fact, David Harbour sat there smoking for almost 20 minutes ignoring people. It’s not shocking but sad. I know the kids are doing the con circuit now and that always affects things. So, I pose the question, should this affect me liking Stranger Things or should it not bother me? I’m just curious what people think. Fanboy Fail Fridays! Getting ROYALLY Dissed By Nomi AKA Elizabeth Berkley And Just Missing Janet Jackson! Doh! With Marcia Cross To Boot! Fanboy Fail Friday! Getting The Big Diss From Mel Gibson and The Hacksaw Ridge Cast! Fanboy Fail Friday! Ian McKellen Part Deux! Mr. Holmes Gets Ushered Out As Madness Ensues! Doh! Not to be the devils advocate it could be because they are minors and I do understand they do cons but those are more in a controlled environment tons of security etc so o get why they wouldn’t maybe let them sign and Winona Ryder she never ever signs so that was also a big factor so she probably also might of had a say. I attended a con that some of the cast attended. There was a VIP party where show goers and guests of the con can mingle, chat and take (free) photos with the guests. David Harbour was there and not only would not allow anyone to take photos with him at the party (this is one of the main perks of going to the VIP party), he had someone from the con run interference so he did not even have to speak to any of the people who did try to approach. I went to the show the next day with my friend and her four girls (aged 6-13), who just wanted to meet the other kids but not get autographs or photo ops. All of the kids were very nice and a couple of them hugged us. So I can see both sides of this, and maybe some small part of me kind of hopes David’s character gets killed off in season two. I don’t think you should stop. I mean annoying as it is that people sometimes ignore us, good shows and stories are still good shows and stories…watch things for their awesomeness. Not just the autographs. I totally get what you are saying there I tried meeting AFI a few years back Davey wasn’t nice at all even yelled at me for bothering him is was way before the show ( had a ticket to the show)after the encounter my feelings towards Davey changed and afi changed.